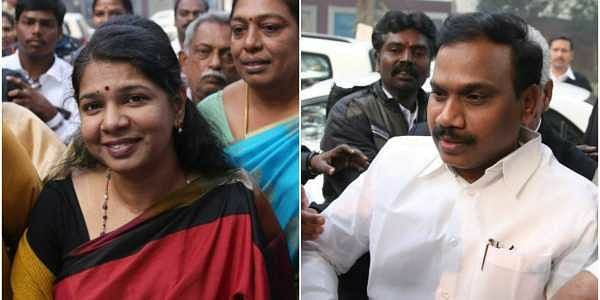 The special 2G court has acquitted Former Telecom Minister A Raja and Kanimozhi, daughter of DMK chief M Karunanidhi & Rajya Sabha MP in the 2G spectrum case. NEW DELHI: Former telecom minister A Raja and DMK MP Kanimozhi were today acquitted by a special court in the 2G spectrum scam case. Fifteen other accused in the case and three companies were also acquitted. All acquitted in the case will have to furnish a bail bond of Rs. 5 lakhs each. This is done to ensure their presence in a higher appellate court if the verdict is challenged. The Enforcement Directorate will appeal against the judgement of the special court that acquitted 19 people in the 2G spectrum allocation money laundering case, agency sources said. The CBI today said it would study the special court verdict on the 2G spectrum scam case and then decide the future course of action. "We are yet to receive the complete judgement. We will study it, take legal opinion and decide future course of action," CBI spokesperson Abhishek Dayal said. Special CBI Judge O P Saini pronounced the judgement in the 2G scam which had rocked the UPA government. "I have absolutely no hesitation in holding that prosecution has miserably failed to prove any of the charges against any of the accused", Saini said. "We are very happy that justice has prevailed. It is a big day for the DMK family. It is an answer to all the blames & the problems we faced", Kanimozhi said reacting to the verdict. Former Telecom Minister and DMK leader A Raja today hailed the verdict. "I will read the judgement and tell. You see everybody is happy," Raja told reporters after coming out of the court room. Congress leader Shashi Tharoor has commented that the justice has worked as it is supposed to work in the country. However, Finance Minister Arun Jaitley has termed the spectrum allocation as corrupt and dishonest policy, which has already been upheld by the Supreme Court in 2012. "I am sure that the investigative agencies will have a close look at it (the judgement and acquittal of accused) and decide what has to be done, he said further. A number of supporters of DMK leaders Raja and Kanimozhi, who were anxiously waiting outside the jam-packed court room, broke into loud cheers as soon as the verdict was pronounced. DMK supporters were seen bursting fire crackers outside the court complex and showered Raja and Kanimozhi with flowers as soon as they stepped out of court.